A newly published study from neuroscientists at the Washington University in St. Louis provides evidence that neural connections between the lateral prefrontal cortex and the rest of the brain make a unique and powerful contribution to the cognitive processing underlying human intelligence. When it comes to intelligence, what factors distinguish the brains of exceptionally smart humans from those of average humans? 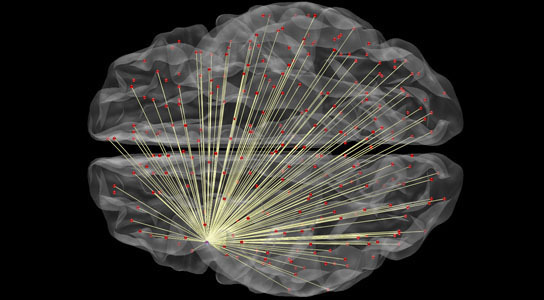 1 Comment on "Images of Brain Connectivity Help Predict Intelligence"
Pedeomorphosis and pareomorphosis are two things related to the connectivity of the brain`s left cognitive lobe and right lobe. The connectivity goes on in all human beings till the age of 21 or even more whereas in animals they are only for short period. Even a big elephant`s mental age is only 5 years of a human baby, even if its physical age is about 50 or more. So elephant will never take vengeance or even worse is assuming a snake`s vengeance behaviour, because its mental age will be only a few months of human growth. All animals are extremely good in character and they hunt only for their food and never broach any enmity amongst themselves. The article`s research clearly shows enormous connection between the two lobes of human brain, which actually is a measure of not only the intelligence but also happens to cause the vileful character of humans growing, to boss everything in the world. Thank You.